The third major expansion for Assassin’s Creed Origins dubbed “Curse of the Pharaohs” will be launched on the 13th of March 2018. 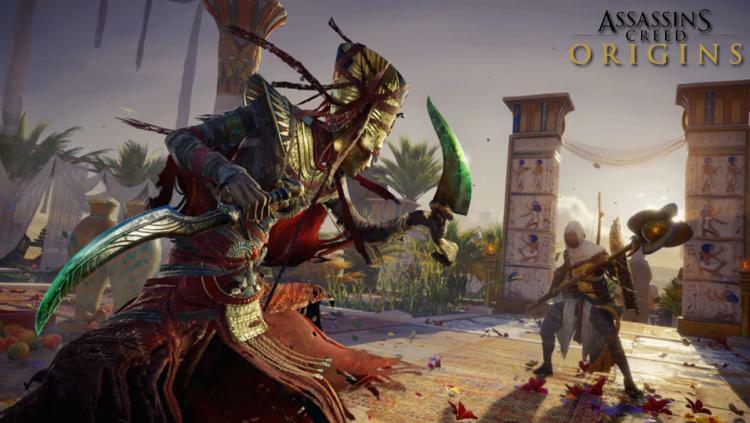 The expansion will take Bayek to explore the mysterious artefact of Thebes and run into undead pharaohs wreaking havoc in the streets instead of finding Order of the Ancients. Hunt down the artefacts that are linked to the undead pharaohs to put them to rest. The new expansion features a new and vast map filled will surprises from the Valley of the Kings across the Nile River to the temples of Karnak. Favour of Osiris rewards you for spending time in the afterlife by gradually refilling Bayek's tools and arrows while playing on the map. To battle your way through the underworld, Bayek's level cap has been raised to 55, and seven new abilities can now be unlocked. Discovery Tour by Assassin's Creed: Ancient Egypt is now available as a free update for Assassin's Creed Origins owners (or as a standalone purchase for $19.99 on PC). Explore non-violently as one of 25 different avatars, the new mode features 75 interactive tours that dive into the history behind the game's reconstruction of the ancient world. Curse of the Pharaohs will launch on Xbox One, PS4, and PC on March 13. It's included in the Season Pass for Assassin's Creed Origins, or can be purchased separately for $19.99. Available on Ubi Store and Steam.